The Mediterranean Dialogue, first launched in 1994, is a forum of cooperation between NATO and seven countries of the Mediterranean. Its stated aim is "to create good relations and better mutual understanding and confidence throughout the region, promoting regional security and stability and explaining NATO's policies and goals." The Dialogue reflects NATO's view that security in Europe is tied to the security and stability in the Mediterranean. It also reinforces and complements the Euro-Mediterranean Partnership and the Organization for Security and Co-operation in Europe's Mediterranean Initiative. 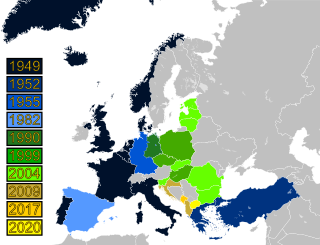 The Mediterranean Dialogue initially started with five countries but has added two more over time. In the 2012 Chicago Summit, NATO heads of states issued a declaration, citing Libya was "welcome" as a NATO partner "if it so wishes", through Mediterranean Dialogue. Libya has yet to respond. On October 16, 2006, NATO and Israel finalized the first ever Individual Cooperation Programme (ICP) under the enhanced Mediterranean Dialogue, where Israel will be contributing to the NATO maritime Operation Active Endeavour. The ICP covers many areas of common interest, such as the fight against terrorism and joint military exercises in the Mediterranean Sea. More ICP agreements were signed with Egypt (2007) and Jordan (2009), and NATO expects further agreements to be signed with additional Mediterranean Dialogue member states in the future. ^ "Chicago Summit Declaration; Issued by the Heads of State and Government participating in the meeting of the North Atlantic Council in Chicago on 20 May 2012". nato.int. NATO. 20 May 2012. Retrieved 3 September 2016. ^ "NATO Press Release (2006) 123 - 16 Oct. 2006". Foreign relations of the Arab Republic of Egypt are the Egyptian government's external relations with the outside world. Egypt's foreign policy operates along a non-aligned level. Factors such as population size, historical events, military strength, diplomatic expertise and a strategic geographical position give Egypt extensive political influence in the Middle East, Africa, and within the Non-Aligned Movement as a whole. Cairo has been a crossroads of the Arab world's commerce and culture for centuries, and its intellectual and Islamic institutions are at the center of the region's social and cultural landmarks. Joint Force Command Lisbon was one of the largest NATO bases in south Europe Allied Command Operations. It was based in Oeiras, near Lisbon, Portugal. In 2009 a French lieutenant general took command from the previous US Navy admiral who had filled the post for a number of years. It was deactivated in 2012. The inaugural session of the Black Sea Forum for Partnership and Dialogue (BSF) was held on June 4–6, 2006 in Bucharest. The Forum is a Romanian initiative, initially meant to hold annual presidential-level summits and thematic or sectoral-cooperation meeting during those annual intervals. The Forum is not meant to create new regional institutions, but rather to turn into a regular consultative process among countries of the extended Black Sea region and between this group of countries and international organizations such as the European Union. After the inaugural summit, no other summits were planned. The 1999 Washington summit was the 16th NATO summit and was held in Washington, D.C. on April 24–25, 1999. The 2007 Arab League Summit, also called the 2007 Riyadh Summit, refers to a convention of leaders from 21 members of the Arab League who gathered in Riyadh for the 19th Arab summit in March 2007. The summit convened on the 28 March 2007 and was preceded by a set of preparatory meetings starting on 24 March 2007. United Nations Secretary General Ban Ki-moon and the European Union's foreign policy chief Javier Solana also attended the summit. The main goal of the conference was to re-launch the Arab Peace Initiative. The accession of Albania to NATO took place in 2009. Albania's relationship with the North Atlantic Treaty Organization (NATO) began in 1992 when it joined the North Atlantic Cooperation Council. In 1994, it entered NATO's Partnership for Peace, which began Albania's process of accession into the alliance. 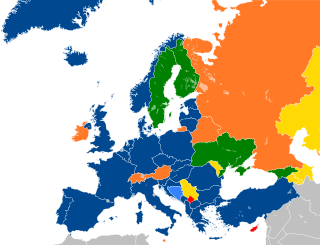 In 1999, the country received a Membership Action Plan (MAP). The country received an invitation to join at the 2008 Bucharest Summit and became a full member on April 1, 2009. NATO maintains foreign relations with many non-member countries across the globe. NATO runs a number of programs which provide a framework for the partnerships between itself and these non-member nations, typically based on that country's location. These include the Euro-Atlantic Partnership Council and the Partnership for Peace. The relationship between Azerbaijan and NATO started in 1992 when Azerbaijan joined newly created North Atlantic Cooperation Council. Considerable partnership between NATO and Azerbaijan dates back to 1994, when the latter joined Partnership for Peace program. Azerbaijan established a diplomatic Mission to NATO in 1997 by the Presidential Decree on 21 November.